Sundek Sports Systems is having a leading position in offering Artificial Grasses to valuable customers. Artificial Grass/Artificial Turf manufacture uses the same machines as conventional carpet tufting, adapted to the longer lengths required in many products.Sundek Sports Systems has extensive experience in the manufacturing, construction, installation and development of artificial turf/ artificial grass for landscaping, leisure, playgrounds and mini sports installations. We have the knowledge and skills to advise you on each system. Our product range is suitable for almost any flooring application. 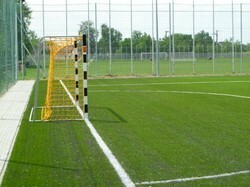 Sundek Sports System offers Artificial Grasses (Sun Turf). 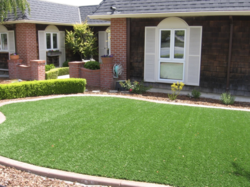 Sun Turf is the closest look -alike to natural grass, and has all the third party international specifications and ratings with respect to Fire, Safety and Environment. The base surface will have to uniform and hard. It cannot be installed over an existing grass surface as that would make the Sun Turf (Artificial Grasses) dimensionally unstable and, due to the uneven nature of the base, the joints would also show. Hence the important requirement of a level base surface. Helps to create a Green and Vibrant lawn all yar around. UV stabilized, designed for outdoor use. Long lasting investment, 8-10 years lifespan. Draincell, being an optional item, would be required if you preferred the surface water to quickly drain out from the surface, especially after a heavy monsoon shower. It has a 20mm thickness. Maintenance of the Sun Turf (Artificial Grasses) is absolutely minimal and very basic. It can be broomed/hoovered and even washed with a water hose regularly, to keep it clean. The surface fibre will never come off in normal use. Sundek Sports System offers Artificial Grass (SunTurf). SunTurf is the closest look -alike to natural grass, and has all the third party international specifications and ratings with respect to Fire, Safety and Environment. Draincell, being an optional item, would be required if you preferred the surface water to quickly drain out from the surface, especially after a heavy monsoon shower. It has a 20mm thickness. The base surface will have to uniform and hard. It cannot be installed over an existing grass surface as that would make the SunTurf (Artificial Grass) dimensionally unstable and , due to the uneven nature of the base, the joints would also show. Hence the important requirement of a level base surface. Maintenance of the SunTurf (Artificial Grass) is absolutely minimal and very basic. It can be broomed/hoovered and even washed with a water hose regularly, to keep it clean. The surface fibre will never come off in normal use. Football is the most widely played and most popular sport in the world. A great game of football can be a thrilling experience made even better by a great playing surface. We offer Artificial grass for Football court with the advancement of technology being used in production and installation of artificial grass. Our offered Artificial grass for Football court have become popular choice of football association for considering them as a replacement of natural grass in football grounds. We are offering a wide range of Artificial Grass to our clients. 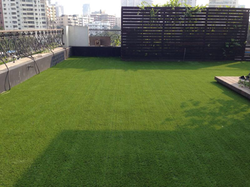 We offered Artificial Turf of Terrace Garden Grass. The terrace garden grass turf is an extensive example of a beautiful transition between hard materials of architecture and softer ones of the gardens. 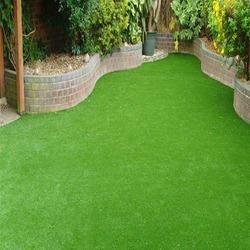 We have manufactured this range as per the standards and have used the best quality raw material to make the grass turf more qualitative and improvised with various features. Sundek Sports Systems engaged in offering a wide range of Artificial Lawn Grass, which is made using artificial plants, flowers and grass. These can be used in recreational areas to beautify the surroundings and make them looker greener. We also offer customization facility, wherein, the size, color, shape and the flowers can be custom-made to suit the varied requirements of our customers.